VelocityShares’ TVIX Exchange Trade Note is a 2X leveraged fund that tracks short term volatility. This post will discuss TVIX‘s inner workings, including how it trades, how its value is established, what it tracks, and how VelocityShares makes money on it. For the most part, TVIX trades like a stock. It can be bought, sold, or sold short anytime the market is open, including pre-market and after-market time periods. With an average daily volume of 30 million shares, its liquidity is excellent and its bid/ask spread is a penny. Like a stock, TVIX’s shares can be split or reverse split. 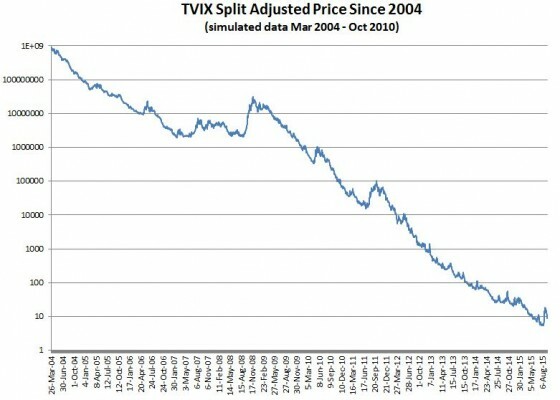 In fact, TVIX has reverse split 6 times since its inception in November 2010. You can see TVIX’s history of reverse splits and my predicted date for the next reverse split here. TVIX has a 1.5X leveraged Exchange Traded Fund cousin—ProShares’ UVXY. It used to be 2X leveraged also but was deleveraged after the February 5th, 2018 volatility Tsunami. Unlike the 1.5X leveraged UVXY there are no options available on TVIX. TVIX can be traded in most IRAs / Roth IRAs, although your broker will likely require you to electronically sign a waiver that documents the various risks with this security. Shorting of any security is not allowed in an IRA. How is TVIX’s value established? Unlike stocks, owning TVIX does not give you a share of a corporation. There are no sales, no quarterly reports, no profit/loss, no PE ratio, and no prospect of ever getting dividends. Forget about doing fundamental style analysis on TVIX. While you’re at it forget about technical style analysis too, the price of TVIX is not driven by supply and demand—it’s a small tail on the medium-sized VIX futures dog, which itself is dominated by SPX options (notional value > $100 billion). According to its prospectus, the value of TVIX is closely tied to twice the daily return of the S&P VIX Short-Term Futurestm . The index is maintained by S&P Dow Jones Indices. The theoretical value of TVIX if it were perfectly tracking 2X the daily returns of the short term index is published every 15 seconds as the “intraday indicative” (IV) value. Yahoo Finance publishes this quote using the ^TVIX-IV ticker. Wholesalers called “Authorized Participants” (APs) will at times intervene in the market if the trading value of TVIX diverges too much from the IV value. If TVIX is trading enough below the IV value they start buying large blocks of TVIX—which tends to drive the price up, and if it’s trading above they will short TVIX. The APs have an agreement with Credit Suisse that allows them to do these restorative maneuvers at a profit, so they are highly motivated to keep TVIX’s tracking in good shape. Ideally, TVIX would exactly track the CBOE’s VIX® index—the market’s de facto volatility indicator. However, since there are no investments available that directly track the VIX VelocityShares chose to track the next best choice: VIX futures. VIX Futures are not as volatile as the VIX itself; solutions (e.g., like Barclays’ VXX) that hold unleveraged positions in VIX futures typically only move about 55% as much as the VIX. This shortfall leaves volatility junkies clamoring for more—hence the 2X leveraged TVIX and the 1.5X leveraged UVXY. TVIX attempts to track twice the daily percentage moves of the S&P VIX Short-Term Futurestm index (minus investor fees). This index manages a hypothetical portfolio of the two nearest to expiration VIX futures contracts. Every day the index specifies a new mix of VIX futures in that portfolio. For more information on how the index itself works see this post or the VXX prospectus. TVIX’s tracking to its target index is not as good as UVXY’s. I’ll get into the details of why later in the post, but on average you pay a premium of around 1% for TVIX shares relative to the index it tracks, compared to a premium of 0.25% for UVXY. For a security as volatile as TVIX this is not an especially big deal, but worth knowing. If you want to understand how 2X leveraged funds work in detail you should read this post, but in brief, you should know that the 2X leverage only applies to daily percentage returns, not longer-term returns. With a leveraged fund, longer-term results depend on the volatility of the market and general trends. In TVIX’s case these factors usually (but not always) conspire to dramatically drag down its price when held for more than a few days. 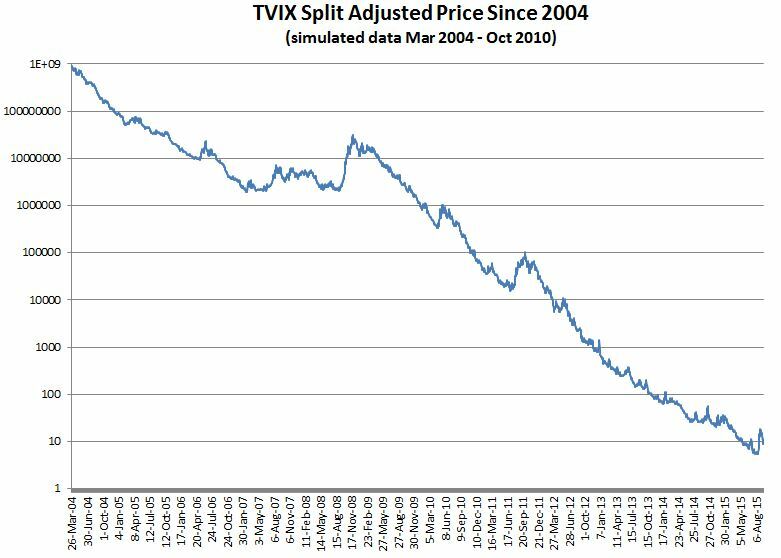 The leverage process isn’t the only drag on TVIX’s price. The VIX futures used as the underlying carry their own set of problems. The worst being horrific value decay over time. Most days both sets of VIX futures that TVIX tracks drift lower relative to the VIX—dragging down TVIX’s underlying non-leveraged index at the average rate of 7.5% per month (60% per year). This drag is called roll or contango loss. The combination of losses due to the 2X structure and contango add up to typical TVIX losses of 15% per month (85% per year). This is not a buy and hold investment. On the other hand, TVIX does a decent job of matching the short term percentage moves of the VIX. 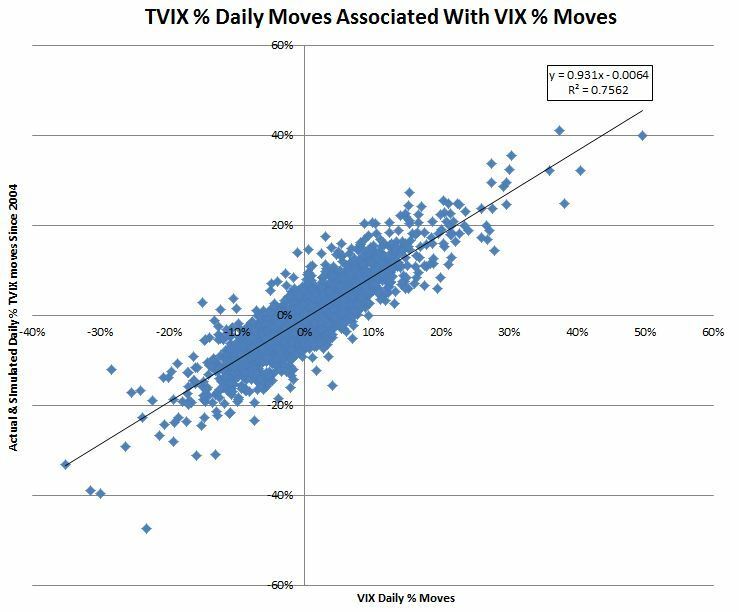 The chart below shows historical correlations with the linear best-fit approximation showing TVIX’s moves to be about 93% of the VIX’s. The data from before TVIX’s inception on October 3, 2011, comes from my simulation of TVIX based on the underlying VIX futures. Most people buy TVIX as a contrarian investment, expecting it to go up when the equities market goes down. 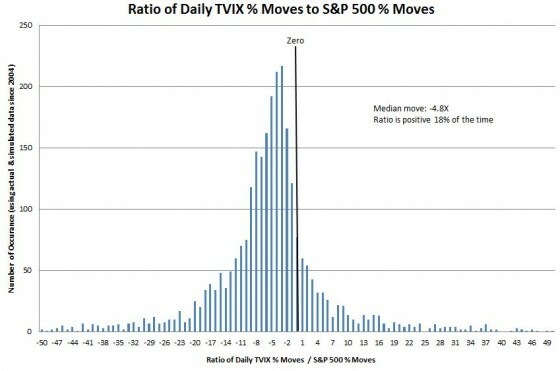 It does a respectable job of this with the median TVIX’s percentage move being -4.8 times the S&P 500’s percentage move. 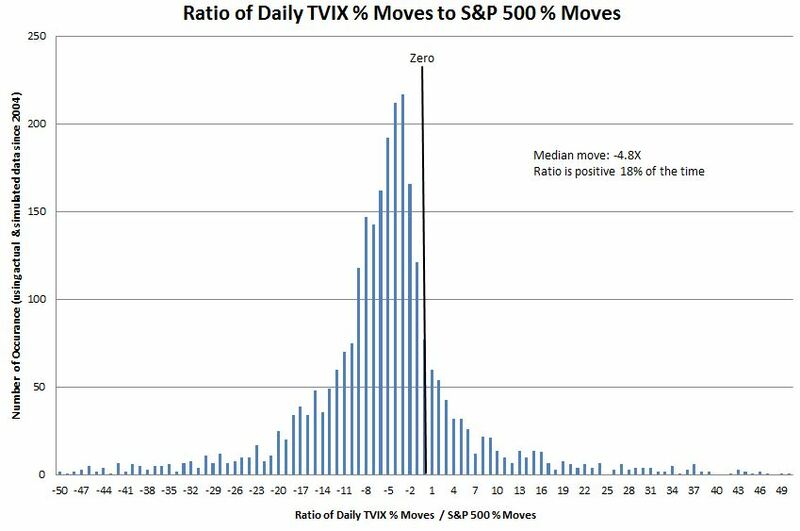 However 18% of the time TVIX has moved in the same direction as the S&P 500. So please don’t say that TVIX is broken when it doesn’t happen to move the way you expect. With erratic S&P 500 tracking and heavy price erosion over time, owning TVIX is usually a poor investment. In fact, even the provider’s marketers who you’d expect to figure out a positive spin, state that “The long-term expected value of your ETNs is zero.” Unless your timing is especially good you will lose money. How do Credit Suisse and VelocityShares make money on TVIX? Credit Suisse, TVIX’s issuer, collects a daily investor fee on TVIX’s assets—on an annualized basis it’s 1.65% per year. With current assets of around $450 million, this fee generates approximately $7.5 million per year. That should be enough to cover TVIX costs and be profitable, however, I suspect their business model includes revenue from more than just the investor fee. 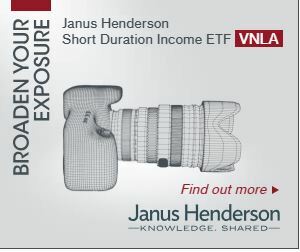 VelocityShares (now owned by Janis Capital Group) – gets a portion of the investor fee for its marketing and branding efforts. Unlike an ETF, TVIX’s Exchange Traded Note structure does not require Credit Suisse to specify what they are doing with the cash it receives for creating shares. The note is carried as senior debt on their balance sheet but they don’t pay out any interest on this debt. Instead, they promise to redeem shares that the APs return to them based on the value of its index—an index that’s headed for zero. To fully hedge their liabilities Credit Suisse could hold the appropriate number of VIX futures contracts, but they almost certainly don’t because there are cheaper ways (e.g., swaps) to minimize their risks. Given TVIX’s inexorable journey towards zero, it would be tempting to assume some risk and not fully hedge their TVIX position, but I doubt Credit Suisse has a corporate culture that would support that. Instead, I suspect they put fund assets not needed for hedging to work earning interest on relatively safe investments like collateralized repurchase agreements. Earning even an extra percent or two annually on $250 million is real money. In February 2012 TVIX’s assets were growing rapidly, climbing several hundred million in a few days to reach $691 million. Normally this would be viewed as a very good thing by an ETN’s issuer, but Credit Suisse was not happy. With a daily resetting fund like TVIX positions need to be rebalanced daily, and with a 2X leveraged fund the positions adjustments needed are equal to the day’s percentage move times the asset value of the fund. So if TVIX was to move +30% in a day, not unprecedented, and the assets were at $690 million, then an additional $207 million in hedging securities would need to be purchased that day. We don’t know the reason, but likely because of the costs of doing that hedging or the risks of a swap’s counterparty defaulting Credit Suisse decided to stop creating new TVIX shares on February 22, 2012. This prevented the assets of the fund from growing any larger. You might think that limiting the number of shares in an ETN would be a good thing for the shareholders—if shares are scarce they might become more valuable. But for exchange-traded products this is a very bad thing. The share creation mechanism is essential to the process that keeps the fund closely tracking its underlying index. Specifically, if TVIX’s value gets too high relative to its index the authorized participants will normally short TVIX and hedge that position with VIX futures-related securities to lock in a risk-free profit. They will continue to short sell, driving down TVIX’s price until the gap between TVIX and the index is too small for this arbitrage transaction to be profitable. Short selling requires that there be shares available to be borrowed, and with Credit Suisse no longer willing to create new shares the supply of borrowable shares dried up completely. As a result, TVIX’s share value became untethered from its index and by the end of March was trading at a 90% premium to the index. In market cap terms there was around $277 million of bogus value in TVIX. In late March 2012 Credit Suisse resumed share creation and the TVIX premium evaporated instantaneously—leaving a lot of stunned and poorer shareholders. Credit Suisse’s solution to their problem was to lay more of the risk on the authorized participants, requiring them to provide the necessary securities before they would create shares. The extra cost of doing this is reflected in the premium (often around 1%) in TVIX’s price over its index. According to ETF.com’s ETF Fund Flows tool, TVIX’s net inflows have been around $2.8 billion since its inception in 2010. It’s currently worth $450 million, so VelocityShares has facilitated the destruction of over one and a half billion dollars of customer money—so far. I’m confident this overall destruction will continue. TVIX’s race to zero attracts a lot of short sellers. That strategy works most of the time, but if your plan is to ride out any volatility along the way be prepared to handle a 4X or more spike in TVIX”s value. Most people are unequipped both financially and emotionally to handle this sort of reversal. TVIX has a proven record as a cash incinerator, but its occasional upward spikes continue to attract speculators hoping to profit from the anguish of the general market. A few traders with impeccable timing or good luck will make good money going long on TVIX. Most will lose money.